The stunning Perhentian Islands are located 12 miles off the northeast coast of Peninsular Malaysia in Terengganu state. The two main islands Perhentian Besar (Big Perhentian) and Perhentian Kecil (Small Perhentian) are included in the Redang Marine Park area and provide a protected environment where fishing and collecting of coral, is prohibited. Popular with backpacking tourists, the islands offer soft white sand beaches which encircled by azure waters and offer several excellent dive and snorkeling sites. The islands can be accessed via a ferry service from the Kuala Besut jetty situated in a small fishing village in Terengganu. The Perhentian islands are closed during the monsoon months of November to March. Labuan Island located off the coast of East Malaysia is one of the three duty-free island sites in Malaysia (the other two are Langkawi and Tiomen). Labuan Island along with its six smaller island neighbors, make up the Federal territory of Labuan, a burgeoning off shore financial center. 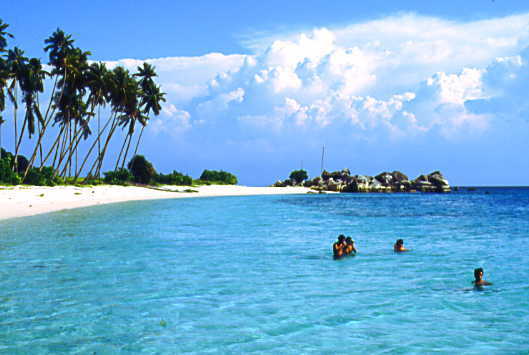 Labuan Island is populated with gorgeous beaches and is a popular spot for shipwreck diving. The main dive sites at Lebuam are Cement wreck, the American wreck, the Australian wreck and the Blue Water wreck. The state of Kelantan located in north-east Peninsular Malaysia is renowned for its many crafts industries that produce the famed handicrafts of Malaysia like Batik, Songket, Pewter and Silverware and intricate wood carvings. Kelantan little known attractions are its many powder-sand beaches like Pantai Cahaya Bulan(beach of moonlight), Pantai Sabak, Pantai Seri Tujuh(beach of seven lagoons) and Pantai Irama , all of which are popular centers of recreation with the state’s local populace. The Tunku Abdul Rahman Marine Park hosts several small islands like Pulau Gaya, Pulau Sapi, Pulau Manukan, Pulau Mamutik and Pulau Sulug. These various islands can be easily accessed by ferry from Kota Kinabalu. Pulau Gaya is the biggest of these islands and is known for its attractions like the Kampung Gaya water village and Police Bay Beach, a 200 km long white-sand beachfront that borders shallow crystal-clear cerulean waters. Gaya Island is also home to two luxurious island resorts- Gaya Eco Resort and the Bunga. Next time you head out to Malaysia, why don’t you bypass the country’s more well-known destinations and travel to one of these lesser known beach destinations to explore discover their innumerable delights?